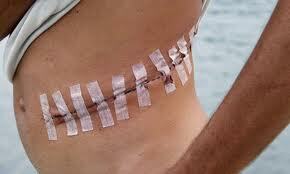 International organ trafficking has become a huge multibillion $ business and it continues to grow. 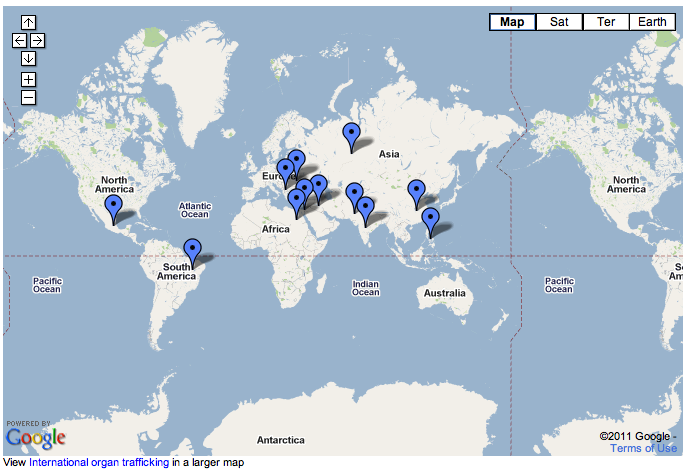 The traffickers have become more and more ruthless and have absolutely no boundaries. An example is Antonio Medina, 23 year old migrant from Central America on his way to USA with his wife were captured by a criminal gang. After being locked in separate rooms, Medina heard his wife screaming. Later on, he entered the room and saw his wife on a table with her chest wide open and without her heart and kidney. Medina was lucky; he and some others were saved by Mexican soldiers. This is the small part of global trafficking as for most of the part, organ trafficking occurs in hospitals where medical practitioners are corrupt and cooperate with traffickers because of the profit. Poor and desperate people can earn between 3,000 to $15,000 for selling their organs, especially kidneys, to middlemen who re-sell them to wealthy buyers for as much as $200,000. Although it happens in most of the countries, however it is more prevalent in Israel, India, China, Pakistan, Turkey, Brazil, Nepal, the Philippines, Kosovo, Iran and the former Soviet states in Eastern Europe. Most of the countries here have weak authorities and poverty makes people desperate to sell their organs to the wealthy. The customers are from the US, Western Europe, the Arab Gulf states, Israel and other wealthy countries. Everybody has 2 kidneys that filter the toxins out of the bloodstream. If a patient with failure in both kidneys will die quickly unless he/she is treated with a dialysis machine or get a transplant. The transplants prolongs the lives of the patients but patients who receive organs from living donors have better survival rates rather than those receiving from deceased donors. China has done it well by attracting sellers and buyers by using the web. The communist country has the world’s highest execution rate and the dead convicts supply healthy young organs at all time. The Chinese justice system works effective and quick for those who are sentenced to death and corrupt government workers take advantage of the situation to earn extra money. Once patients arrive to China, the organizers will force them to bid more than the others so that a single organ will go for the highest price. They are forced to sit at the hospital and wait and watch who will get the organ from the executed prisoner. This globally black market is deceptive and dirty. The traffickers use deception, violence and coercion to buy and sell organs from desperate people and sell them for much higher price to more developed countries. These middlemen form partnership with doctors in different hospitals who perform these transplants for an arranged fee and no questions. The numbers from World Health Organization (WHO) reveals that 5000 people sell their organs on the black market each year. 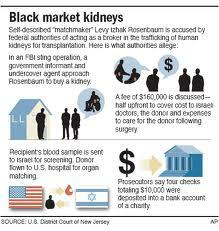 Many of the black marketed kidneys harvested by the rootless gangs are destined to patients in Israel. With a population of 7,4 million and a very modern medical system, Israel has a alarming shortage of donors because of the religious belief. Only 12% of Israelis are registered as donors according to the Israeli National Transplant center. What’s positive is that the Israeli police has been very aggressive against organ traffickers and managed to break up 3 international gangs since 2008. The criminals profits from the poor and the sick, both parts that try to survive. They will pay a seller $10,000 and collect $150,000 from the patient. The buyers are flown to cities and hospitals to wait for the procedure until they find a recipient. Unfortunately, there are corrupt doctors everywhere and it is impossible for them not to know about the transplants because of the money that is involved. How can they not know about whether the donor is a blood relative or not? Not only the middlemen, but the doctors must also be held accountable together with everyone that is involved. 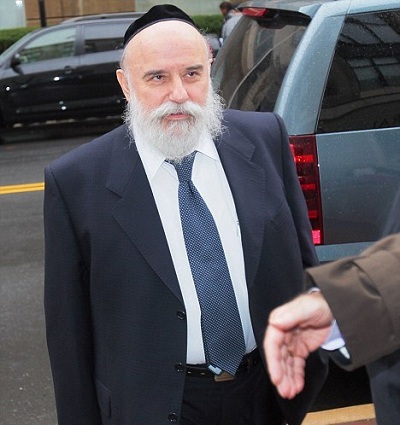 Levy Izhak Rosenbaum, from New York, admitted in a Trenton federal court to brokering three illegal kidney transplants for desperate New Jersey-based customers in exchange for payments of $120,000 or more. He also pleaded guilty to a conspiracy count for brokering an illegal kidney sale. Rabbi Yosef Shalom Elyashiv, a prominent and leading arbiter of Jewish law in Israel advises that donating body parts violates the religious faith, which states that “upon death, a body should be buried intact.” This has lead to a huge shortage of donors and the list of patients is growing. The result is that money hungry gangs prey on these desperate people. Shmuel Eliyahu, chief Rabbi of Safed, Israel has started a project to get 100 colleagues to sign a document advocating organ donation. “The Torah tells people to help others when they can, especially if it means saving a life. Donating an organ is a mitzvah, or good deed, “he said. In this area, there is a network of Bedouin smugglers who steal organs from refugees who travel in the harsh desert in search for a better life in Israel. If they can’t pay for the large amount of money to their smugglers, they have to pay with their organs. Many African refugees have been found in the desert with their organs missing. The most dangerous and cruel traffickers are the Sawarka Bedouin tribe who steal organs from refugees coming from Ethiopia, Eritrea or Sudan. If they can’t pay, the men lose their organs and the women are raped. Al-Azazy, a human rights activist stated that the victims are drugged before the traffickers remove the organs as the organs aren’t useful when the victim is dead. After the surgery, the victim is dumped in a dry well where hundreds of other bodies rest. They all have one thing in common, and that is the deep scar they all carry. This heinous act is a shame and the corrupt Egyptian doctors are working together with the Bedouins and perform the surgery in mobile hospitals. According to information from WHO, kidney transplants are carried out in 91 countries. Approximately, 66,000 kidney transplants, 21,000 liver transplants and 6000 heart transplants were performed globally in 2005. Organ harvesting is going on at full speed in Philippines, Turkey, Iran, central Europe, mainly in the Czech Republic, Caucasus, mainly in Georgia, Pakistan, India, Africa; such as Mozambique and South Africa as one of the main countries. The surgeons removes kidneys, lungs, pieces of liver, even corneas, bones, tendons, heart valves, skin and other sellable human bits. The organs are kept in cold storage and air lifted to illegal distribution centers in the United States, Germany, Scandinavia, the United Kingdom, Israel, South Africa, and other rich, industrialized locales. This barbaric business makes more money than human trafficking and drug trafficking. The Middle East residents of the Gulf States (Kuwait, Saudi Arabia and Oman) have travelled to India, Philippines and to Eastern Europe for many years to purchase organs because of some Islamic teachings that allow organ transplantation to save life but prohibit organ harvesting from brain-dead bodies. Police arrested several people for running a kidney transplant clinic in Gurgaon, Delhi. The kidneys came mostly from poor people from Uttar Pradesh and transplanted to clients in USA, UK, Canada, Saudi Arabia and Greece. Dr. Amit Kumar, who ran the clinic and the guesthouse, was arrested in Nepal on 7 February 2008 but not surprisingly, he denied having anything to do with the trafficking. Officials seized a bank draft worth Rs. 936,000 together with €145,000 and $18,900 in cash. He tried to bribe the Nepali police but was not successful. The donors were lured to the clinic for job opportunities and then asked if they were willing to donate their kidney for the amount of Rs. 30,000. If they resisted, they would forcedly be dragged into the operation room. I personally stand for saving lives but this type of harvesting should not happen in the 21st century. The way the eastern Europeans and Chinese perform the surgery reminds me of the death camps in Nazi Germany. There are many pictures on the internet showing dead naked bodies dumped over each other on the floors. All of them are opened up and emptied for organs. It’s disgusting and inhuman how a human life can be taken away so easily. As long as there is a shortage of donors, the business will continue flourishing. It is sad to think about all those who are chained to the bed waiting for a kidney, liver or heart but no one has the right to murder another human being for the sake of money. “When I look in the mirror and see that scar, it’s a daily reminder of what I went through,” he says. “I feel this raw grievance inside.” Abdullin, 28 from Azerbaijan. Thanks for appreciating my work. You will definitely get to see my next post in a few days. Thanks dear, comments like these encourage me. Hi there, You have done an incredible job. I will definitely digg it and for my part recommend to my friends. I am sure they will be benefited from this website. Thanks for your appreciation and recommendation. Well dear thanks for appreciation, I hope I continue to provide you with more informative articles in the future as well. Happy New Year to u too Alfred. Do you mind if I quote a few of your posts as long as I provide credit and sources back to your website? My website is in the very same niche as yours and my visitors would really benefit from a lot of the information you provide here. Please let me know if this alright with you. Thanks!